Do you find that you never have enough room on your iPhone for all the movies, TV shows, and podcasts you want to carry around? Then Air Video, may be the app you’ve been looking for. Air Video is a simple app that allows you to stream video from your computer to your iPhone, over the internet, via WiFi. It requires a free Air Video Server application to be installed on your computer. There is a Mac and a Windows version. Once the server is installed, you need to set up what folders you want to share with your iPhone. 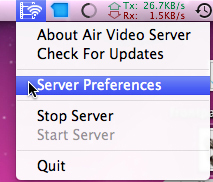 Simply right click the icon in the task bar, and select “Server Preferences”. Then you can select as many folders as you want to share. Just click the “Add Disc Folder” button, and browse for the folders you want. Under the “Settings” tab, you can set up your password, choose a custom listen port, and set the dimensions you want the video to stream. You will also need to set up Remote settings, to access your files over the internet. 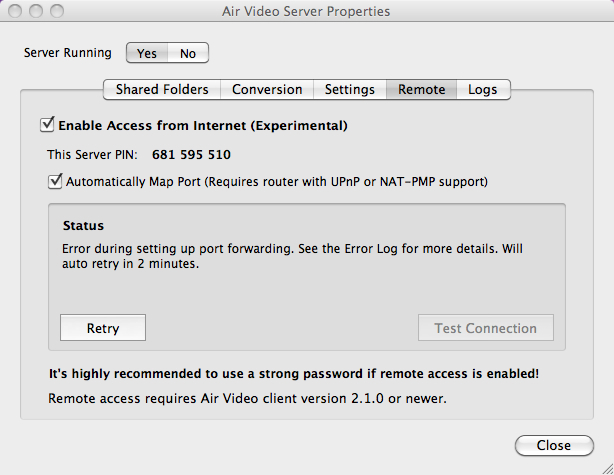 The Air Video Server will automatically map the ports necessary to stream your video over the internet. If this isn’t working, you can manually set this up. In my case, it wouldn’t set it up automatically, but I read there have been some issues with this mapping ports through an Airport Extreme. After manually setting up the port mapping all is working fine. Now that the server is set up, you need to download the Air Video app, for your iPhone. It is available in the App Store for $2.99, and there is a free version if you want to try it first. Open the Air Video app, and tap the “+” in the upper left, to add a server. 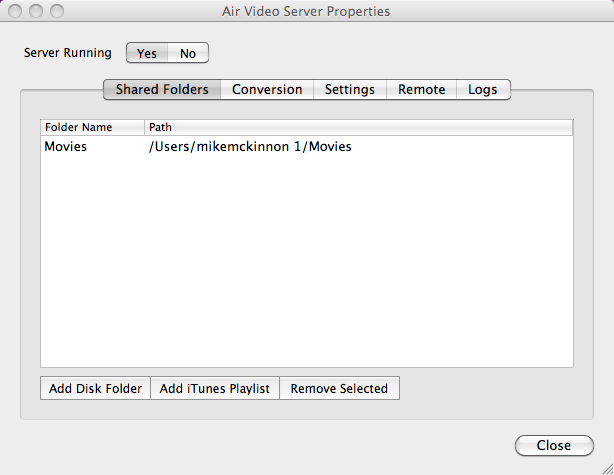 It will automatically find any computers running the Air Video server. Just tap your computer to add it. Then you can go through the folders you set up to share, earlier, and pick a video to stream. For remote access, you need to enter a server PIN. You can do this by tapping the “+” button, then tapping “Enter Server PIN”. 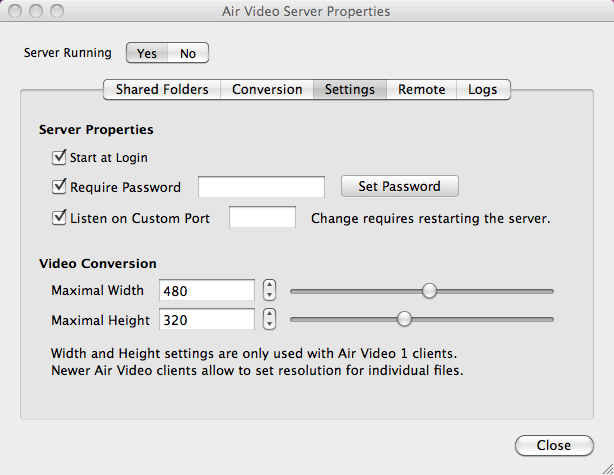 Once you’ve selected the video, Air Server will determine what type of video it is (.avi, .mp4, etc). If it is anything but iPhone format, the Air Video Server with convert the video, live, while it is streaming to your device. You can adjust how the video is converted and streamed. Once you’re ready to start the stream, you have the option to start at the beginning of the video, or “Seek” for a certain point in it. If you’re restarting a video, it will ask if you want to continue from where you left off. When you hit play, there is a bit of a delay as the video buffers, especially if you are converting on the fly, but once it gets going, the video plays quite smooth, and the quality of the video and the audio are great. If you are on a slow connection, you may experience some lag in playback. Thanks for reading this week. Please check my blog Green Candy for iPhone related news, tips, and tricks. You can also follow me on Twitter: @rorypiper.